– We all think we have experienced difficulty concentrating in school, if we had slept with the phone next to our head, and sometimes also experienced having difficulty sleeping, explains Lea Nielsen, who is one of the five aspiring researchers. The “healthy” cress without the influence of the router. 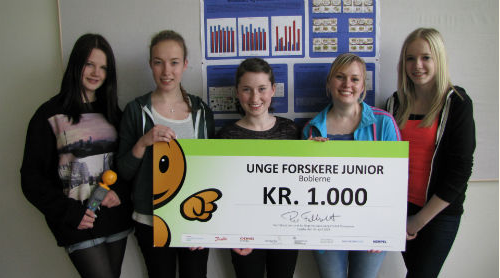 Read more via C4ST – Danish Students Attract International Attention with Cress and Wifi Experiment. Me any my son, Charlie (aged 2),are repeating this experiment. We’re two days in of the 12 days. We are observing, measure, weigh and take pictures along the way. The results after two days are clear: cress seeds next to the router are growing well. None of them are mutated or dead. The cress away from the router are also growing well. Hopefully someone will publish our results. Although as the results are rather mundane I expect no one will. Freddie, Beatrix, Pam, Maureen etc. You can buy cress seeds at very low cost, cotton wool also. 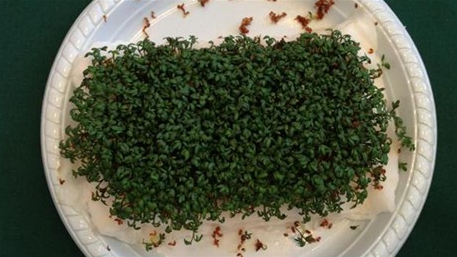 I strongly urge you to repeat this experiment and make your own minds up on the dangers of wifi radiation on cress. My son thought it was fun. Dave, you have hit upon one of the conundrum’s that a lot of scientists face when researching the effects of RF. Repeatability of a test. It is very difficult to repeat a test following exactly the same test scenario and conditions unless you perform the same test in the same location with all the same influences. In your case, did you use 2 routers like the girls did? Are they the same models? Wireless routers come in different flavours and operate on different carrier frequencies i.e. 2.4, 3.6, 5 and 60 GHz frequency bands, have different modulation patterns for sending information at different rates i.e. 54Mbit/s to over 800Mbit/s per second. Example 802.11a, 802.11b a, 802.11g, 802.11ac, 802.11n etc. Was the seeds placed in the same location relative to the antenna? Did you have any equipment like a wireless laptop turned on streaming video using the wireless network to ensure you were using the wireless to its maximum potential? If not it is not a case of apples and apples so to speak. Nice to see people trying to emulate the test. I will say one thing however, using a wireless laptop in close proximity to a wireless router has always given me headaches, pressure in my chest and prickling sensations on my skin within 10 minutes from the beginning of usage. Now whether this equates to harm is yet to be fully determined although having heart beat irregularities triggered by the more power routers cannot be a good thing. Knowing this I have made the choice to avoid wireless at all costs where I can. But people need to make their own judgements based on their own experience. Having a young child near a router which could be potentially harmful does not sound like a very smart move in my opinion. Dave, I forgot to mention that the 2 routers at the Girl’s school probably service 1 or more class rooms of students who would each be using a wireless computer so I don’t think your test is truly representing what is happening in the classroom environment. Their seeds are likely being subjected to a lot more radiation than what you are attempting in your test. Personally, I support the use of “My will” letters or a Mandate that makes it quite clear what you the people want. My personal feeling is that Petitions are like a servant begging. We are free people, flesh blood and bone and we bleed. We have no need to beg from our servants ()the parliament). we are the master, not they! Because they are are installing them worldwide, without our approval, I really think that the article that this came from needs to be taken seriously. In the bigger picture, it’s now clear that the uppermost purpose of the the ‘smart grid’ is to function as a technocratic spy grid, purposed to assert total surveillance and induce mind-altering radiowaves. This was dreamed up and written about in detail in the 20′s and 30′s, by M. King Hubbert and Howard Scott. In the 60′s and 70′s, fascist control-monger and Trilateral Commission co-founder Zbigniew Brzinsky made public these plans, and wrote about it in his various works, relabeling “technocratic” as “technetronic”. Why is there such a rush to get them in, without proper OPEN scientific study. I have been a teacher for 30 years. Sadly, I have had to give up work , as I have become electro sensitive ( I believe this was triggered by a smart meter on our house). I could not tolerate the Wi-Fi in the classrooms ( or any EMR) . I would suffer an extreme head pressure, my face would feel like it was burning , my vision would become blurry and I just could not think clearly . I personally know of three other teachers that this has also happened to. One teacher was so seriously affected by the wireless emissions that she suffered a dangerous heart arrythmia and ended up in hospital. She is still on sick leave, and says she will probably not be able to return to the classroom. Three of us met with the Education Minister, Martin Dixon to discuss this most concerning issue and present him with an abundance of evidence from respected physicians, doctors and scientists about the dangers of chronic, long term exposure to low level microwave radiation, with children being especially at risk. We also gave him written testimonials from several parents whose children were suffering adverse symptoms from the Wi-Fi at their school . His comment was ” I am not a scientist, I rely on the experts “, which in this instance is ARPANSA. We all know where that has gotten us !!!!!!! Check out the wi-fi in schools Australia website to learn more. So sad about Wi-Fi in schools. My son is always exhausted when he comes home from school, but is fine during school holidays (we have no Wi-Fi or other wireless devices at home). I even find it hard to attend parent-teacher interviews, as there are Wi-Fi routers on the ceiling of the hall where the interviews are held and I find myself getting dizzy and disorientated. I get better when I leave the hall. Why are we doing this to our children!!! How can the teachers stand it! Isn’t it an OCCUPATIONAL HEALTH AND SAFETY ISSUE for them to be immersed in a class 2B carcinogen all day, 5 days a week? My daughter returned from an exchange period in a European country and the high school she was attending there had NO Wi-Fi at all, just a few cabled computers students could access, but otherwise they still learned the old fashioned way – from a TEACHER (not a laptop)! She felt that students there were doing better academically than here, so the absence of Wi-Fi did not seem to hold them back. I have also met a mother who has decided to home school her 6 year old, as she doesn’t want him exposed to Wi-Fi from such a young age. If I had primary school aged children, I would do the same. We know that radiation penetrates the young ones’ little bodies so much more than adult ones. Shouldn’t the school obtain informed consent from the parents first, before exposing their children to a known carcinogen. And let’s not forget the link of EMR with autism, ADHD, neurological disorders. It breaks my heart that as a society we are allowing this to be done to our children. They are innocent, they trust us! We are living in a nightmare Sci-fi world except that it is not a science fiction story it is FACT and we are being destroyed by our own government and utilities for BIG DOLLARS. (Isn’t that what it is always about?) We have got to fight on until we win this battle or we might as well kiss our grandchildren goodbye!